The 13.125" Medium Gyuto kitchen knife by Kanetsune is the perfect choice for your medium to larger cutting jobs. Sporting a 33 layer Damascus steel blade with a VG-10 stainless steel core is beautiful and functional. The long cutting edge chops, minces and slices with ease and minimal effort. 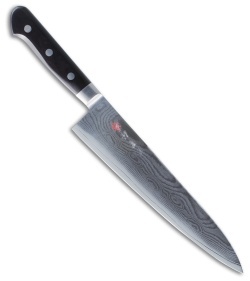 A comfortable black handle allows for exceptional control of the knife with little to no hand fatigue.